The Tesla Powerwall 2 is a game-changer. Solarbank is proud to have partnered with Tesla Energy as a Tesla Certified Installer. Solarbank can install the Tesla Powerwall 2 to new and existing Solarbank customers. The Tesla Powerwall’s stylish looks and advanced lithium-ion technology inherited from Tesla’s electric vehicles make it the home battery solution many have been waiting for. Solarbank technicians have been trained by Tesla Energy and are Certified Tesla Energy Installers meaning Solarbank will install your Powerwall 2 to the same high standards of workmanship that have made us one of the leading independent solar companies in Sydney. The Tesla Powerwall 2 is available now from Solarbank. The Tesla Powerwall is a home battery system that turns your daytime solar generation into an all day energy resource available when you need it. The Tesla Powerwall enables you to get more from your solar system, reducing your dependence on the electricity grid. 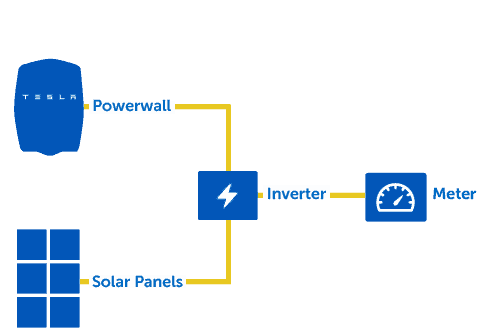 The Powerwall allows solar system owners to retain the solar energy produced by their system. You’ll no longer be at the mercy of your energy retailer and you can have a back up power source during a black out. The Powerwall’s stylish and sleek design make it a desirable addition to any home or garage. Powerwall’s functionality and performance are what is giving homeowners a new ownership over their energy. Previously, solar batteries were bulky, expensive to install and expensive to maintain. In contrast, Powerwall’s lithium ion battery inherits Tesla’s proven automotive battery technology to power your home safely and economically. Completely automated, it installs easily and requires no maintenance. Powerwall 2 offers significantly greater energy capacity and power discharge to its predecessor and to most of the other home battery products in the market. The Powerwall's stunning good looks and sleek wall mounted design make it's visual appeal as impressive as it's functionality and performance. Taking up no floor space means there is a suitable location for the Powerwall in almost every premises. The Powerwall can be installed indoors or outdoors and has a self-contained liquid cooling system ensuring the battery cells operate at the optimum temperature. Indoor or outdoor, you'll want your Powerwall installed where it's sylish good looks are on display. 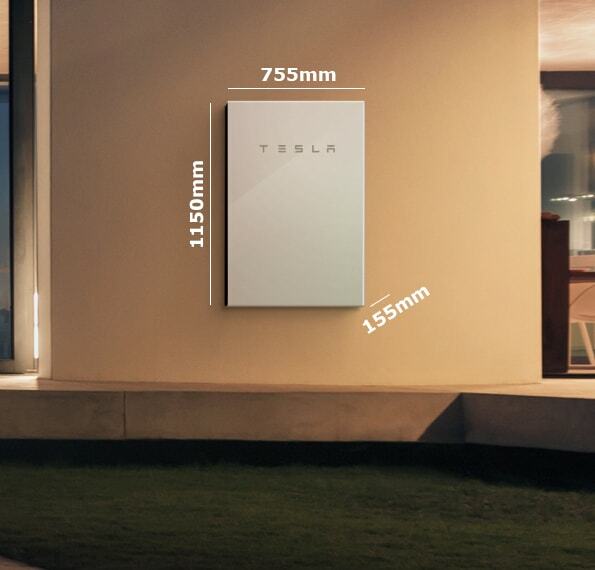 The Powerwall inherits the proven battery technology from Tesla's award winning electric vehicles. Tesla is a global leader in electric vehicles powered by lithium-ion batteries. 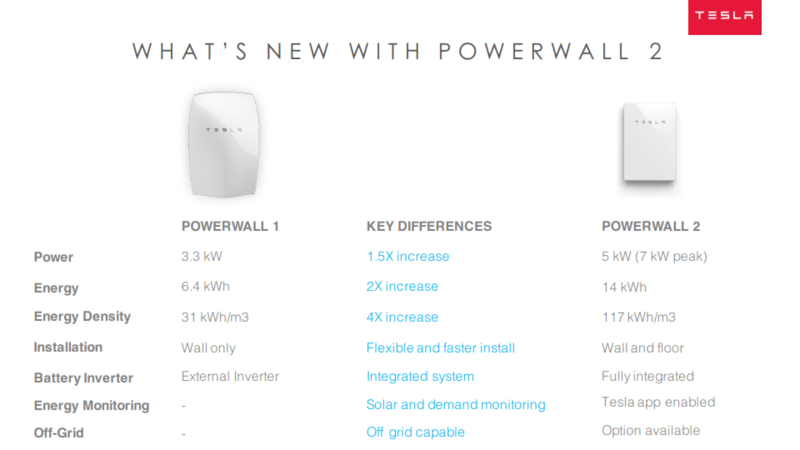 The Powerwall is scalable to suit the specific requirements of a home or business. Up to 9 Powerwalls can be connected for a single installation. Based in Sydney, Solarbank is a leading provider of high quality solar power and battery solutions. We offer you a tailored solution to suit your individual or business needs. To determine the best solution and best installation, Solarbank undertakes a detailed analysis of your usage patterns and your existing solar system (if you have one). Solarbank will not just make recommendations over the phone, or offer to only send a quote. One of our solar experts can come to you to get a detailed understanding of your situation and energy needs and make a recommendation for the most beneficial system for you. Solarbank services the greater Sydney area, giving you local after sales support should you need it. 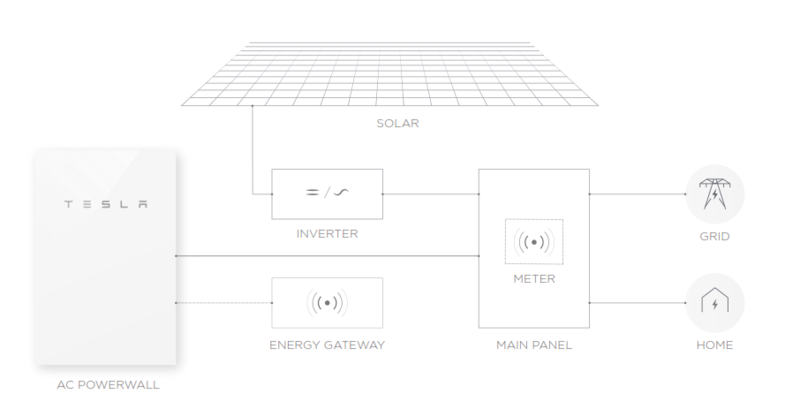 Why add a Tesla Powerwall home battery to your solar system? With a battery you can stop giving the power companies your solar energy to sell to someone else. Solar power is generated during the day, and for most homes the majority of the electricity is used at night. As a result, many solar system owners are missing out on the potential savings of their system and are forced to buy back power at a premium at night. The Tesla Powerwall 2 can also provide back up power during a black out meaning your neighbours will be knocking on your door for a cup of tea when the power is out. This is why it is predicted that over 1 million Australian homes will install a solar battery over the next 5 years. Why choose a Tesla Powerwall 2? The Tesla Powerwall is an extremely stylish and technically advanced home battery that comes with a 10 year warranty. Solarbank has chosen to offer the Powerwall as part of our high quality solar solutions due to the safety, performance and design features of the product. The Tesla Powerwall 2 can be wall or floor mounted with a sleek design and can be installed either indoors or outdoors. 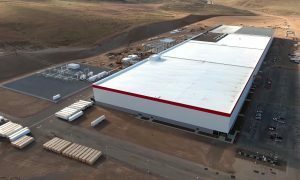 Tesla Energy has extensive experience in manufacturing lithium-ion batteries with the Tesla Powerwall 2 using the same battery technology found in Tesla electric cars. The Powerwall is one of the safest, most cost effective and high quality home battery solutions on the market. Can a Tesla Powerwall 2 give me back up power if there is a black out? Yes. The Tesla Powerwall 2 can be configured to provide backup power. Power outages can be a thing of the past. I already have solar power, can I add a Tesla Powerwall 2? Yes. The Tesla Powerwall 2 can be added to any existing solar system. The Tesla Powerwall 2 is an AC coupled system meaning it is connected independently of any existing solar inverter. Solarbank can recommend the most suitable retrofit approach as well as inspect your existing system to make sure it’s working as it should be. What if I don’t already have a solar system? Solarbank can install a Tesla Powerwall 2 as part of a complete new solar system with solar panels and a solar inverter. Solar panels are considerably cheaper than batteries due to the very generous subsidies still available for solar panel installations. It is now more affordable than ever to install a complete solar power system with panels and a Tesla Powerwall 2 battery. What’s New With Powerwall 2? Powerwall 2 is more compact than its predecessor and boasts better specs all round. Wall or ground mounted, rechargeable lithium ion battery with liquid thermal control. Requires installation by a trained Tesla Certified Installer. What sort of inverter and other equipment do I need to install a Tesla Powerwall 2? This is how Powerwall 2 can be AC-coupled to ANY existing solar PV system. How and where can the Tesla Powerwall 2 be installed? 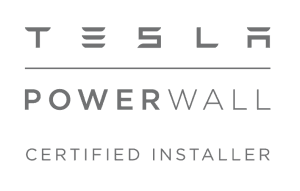 Powerwall 2 is rated for both indoor and outdoor installation. A Solarbank representative can visit your home or business and determine where the most suitable location for a Powerwall would be. Generally the best place for a Powerwall to be installed is in the garage. Does the Tesla Powerwall require any maintenance? There is no maintenance for a Tesla Powerwall. Tesla will update the firmware on your Powerwall remotely via software updates to keep your Powerwall operating at its best. How many times a day can I charge and discharge a Tesla Powerwall? Your Tesla Powerwall can be charged and discharged multiple times per day. This effectively matches surplus solar generation with periods when your energy usage exceeds what your solar system is producing. When the Powerwall is fully charged, can I still sell excess solar power to the grid? Yes. If your solar system is producing more power than your home is using and your Powerwall is fully charged, the excess solar power will be sold to the grid. In Sydney, the credit for excess solar sent to the grid is usually between $0.05 and $0.10 per kilowatt-hour. What is the warranty on a Tesla Powerwall 2? Tesla warrants that your Powerwall will be free from defects for 10 years following the date it was first installed. In order to provide the full 10 year warranty period, Tesla requires the ability to update your Powerwall through remote firmware upgrades. Solarbank will connect your Powerwall to your home Wi-Fi network and register your system with Tesla. When your Powerwall is installed and connected to the internet, Tesla will update your Powerwall through over-the-air software upgrades from time to time. This ensures your Powerwall is operating at its best. If your Powerwall is not connected to the internet for an extended period, or has not been registered, Tesla may not be able to provide important firmware upgrades. You will be notified if your Powerwall has lost its connection to the internet. Where is the Tesla Powerwall made? The Tesla Powerwall 2 is manufactured in Tesla’s Gigafactory in Nevada, USA. How safe is the Tesla Powerwall? The Tesla Powerwall has been developed with safety as the highest priority. The Powerwall has multiple levels of inbuilt protection and utilises the same proven battery cell technology and safety features as found in Tesla electric cars. The Powerwall has an intelligent internal Battery Management System and advanced liquid cooling system to ensure the battery will always operate in a safe manner. How does a Tesla Powerwall 2 store excess solar power for use at night? The Tesla Powerwall works together an energy meter to store excess solar power generated during the day for use at night. The energy meter is installed in your meterboard and detects when more solar power is being generated than can be used in the home. The energy meter communicates with the battery via a data connection and the inbuilt battery inverter will begin to charge the Powerwall to stop the excess solar generation from flowing out to the grid. When the battery inverter detects, via the energy meter, that there is insufficient solar generation and the household is drawing power from the grid, it discharges the Powerwall to supply the energy needs of the home. How can you monitor the charge status of a Tesla Powerwall 2? You can monitor the state of charge and operation of your Tesla Powerwall via the Tesla Energy app. 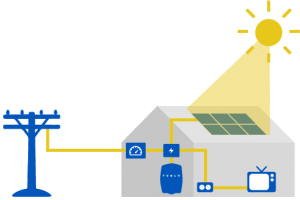 The monitoring application give you detailed information about much power your current solar system is generating, how much energy you have stored and how much you are purchasing from the grid.